Nominations for the fifth edition of the Design & Architecture Awards 2017, in partnership with Grohe, Europe’s largest and the world’s leading premium single-brand manufacturer and supplier of sanitary fittings, are open till December 30 – apply now. These highly coveted awards focuses on the complexities of building project from a design, aesthetic, sustainability and conservation perspective, as well as a strong sense of purpose. 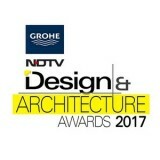 The awards takes a collective view of the results confidentially selected after rigorous assessment by the Jury comprising of eminent architects & interior designers. We hope to continue our journey of honouring and celebrating the highest standards of architecture.